I had an odd relationship with NetherRealm’s new fighting game since the time it was announced to the time of its release. The idea of a gritty fighting game starring the DC heroes and villains was interesting. The lack of the developer’s signature ultra-violence was disheartening and it seemed like the game was going to fall to the wayside as Mortal Kombat 9 with a DC skin. After getting the game earlier than expected because of my need for a fightstick, I can gladly report that Injustice: Gods Among Us offers enough fresh hooks and ridiculous moments to set it apart within the fighting genre. Flipping through the menus, it quickly becomes evident that all the modes are essentially those available in Mortal Kombat 9. The basic (and crazy) story mode is present, along with a classic arcade ladder that has unlockable modes which implement different changes, such as adding time limits or cutting out health restoration between fights. A tutorial is also available to teach players all the different mechanics, but learning when to use certain skills requires taking part in actual fights. Going back to the story, like I said, it is crazy. The set-up for the story was detailed in a comic that came out a while ago, but allow me to give a condensed version: The Joker captured a pregnant Lois Lane and connected her heart to a device that was also connected to a nuke. He then drugged Superman so he thought Lois was Doomsday and — in being the great hero he is — he punched his pregnant Doomsday baby mama into space which killed her and set off the nuke that leveled Metropolis. Keep in mind this is all just the set-up. The in-game story involves cross dimensional travel, good guys that are bad guys and vice versa, and some hot Cyborg on Cyborg hacking action. Despite hitting extreme levels of ridiculous and stupid, I came to appreciate and laugh at the insane moments and it all boiled down to an experience that I found enjoyable. Playing through the story will let you experience about half the characters the roster has to offer. This is a great way to introduce yourself to the variety of character types. Each character has different strengths and weaknesses, and (save for a few over-powered characters) the game seems to be balanced very well. Characters also come with their own specials activated by the same button. 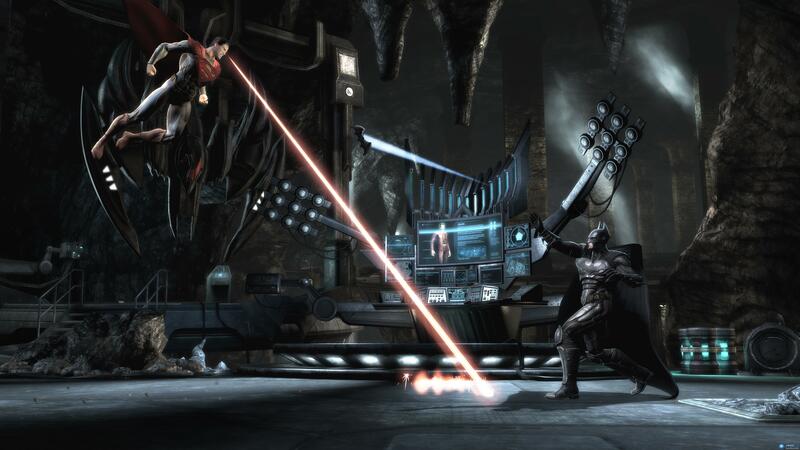 Green Arrow can equip different arrow types, Flash increases his speed greatly over the opponent, and Superman uses the sun to strengthen the power of his attacks. Unique stage interactions also offer a level of variety that plays into the over-the-top nature of the game. Each combat stage offers a variety of objects you can interact with, whether it be riding Nightwing’s motorcycle into your opponents or throwing them into a flying helicopter. Transitions also add a level of technique and planning to the fights, during my play time online I found that battles would often come down to last second position swapping so that either my opponent or I could knock the other through a wall, dealing damage and moving the fight to another area. All of these mechanics add a level of fluidity and flair to the combat that make the game more accessible to the player more interested in the comic book characters than the fighting game genre. These added mechanics would mean nothing if the base combat was not good, and luckily everything feels solid. In Mortal Kombat fashion, moves are fairly standalone, but experimenting with separate moves can result in the discovery of powerful combos. Juggling is also a big focus, with timing being key to keeping an opponent off the ground. Blocking has now moved to the back button instead of having its own designated button. This switch seems odd at first, but the system works well and feels natural after playing a few rounds. The multiplayer also keeps the same modes as Mortal Kombat, but adds in a practice mode that grants infinite health bars so friends can duke it out while experimenting without penalty. I found the most fun to be had in the King of the Hill mode: Eight players are dropped into a lobby where two players fight and the winner progresses as the loser moves to the back of the line. Spectators can vote on who they expect to win and pick challenges that the next combatants can try to complete for extra experience. The over-the-top nature of the game makes every match enjoyable to watch, even if the players have no idea what they are doing. Everything about Injustice has a sense of familiarity to it, but detaches itself enough to feel like a different experience. NetherRealm has crafted a game that has the accessibility and fun of a more popular game like Super Smash Bros. while keeping the combat of higher level fighting games. 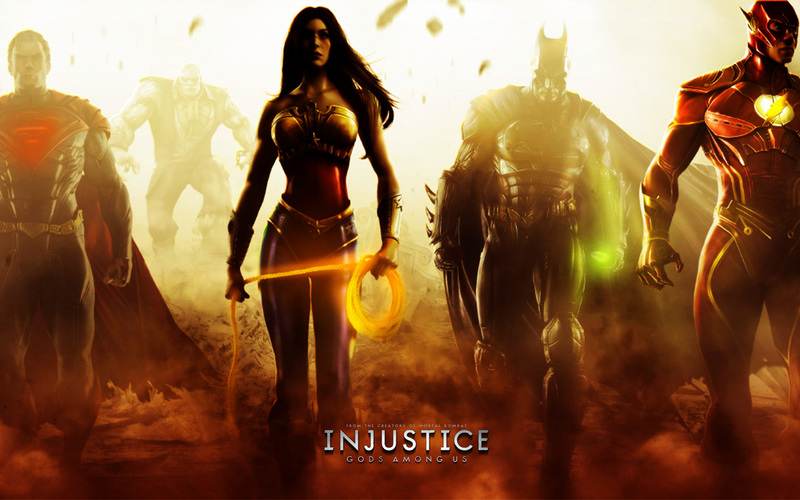 While it is not a god in the fighting genre, Injustice: Gods Among Us provides depth of combat for those looking for it and a fun shallow end for the person who just wants to see Batman tase Superman and then run him over with the Batmobile.